for today's post i asked my friend michelle to write about her ten favorite things to do in her hometown of portland. i still have never been there, but after reading this list am dying to find a way to make it happen! Portland is the most unique city that I’ve ever been in. Whenever someone finds out that I live in Portland, they ask me if I’ve seen the TV show “Portlandia,” to which I respond: “Yes. And it is 100% accurate.” The writers for that show just need to walk around downtown and they will have plenty of material. There is lots of weirdness, but that means that there is so much character. Plus, there is plenty to do and are lots of hot spots for foodies. I describe the atmosphere as being a big neighborhood. It’s a big city, but it still feels like a neighborhood where people still say hi to each other on the street and the house was quaint. When Brittany asked me to write about the perfect day in Portland, I couldn’t resist! I love the City of Roses! 1. If the weather is nice, take a bike ride along the waterfront. Or, like a native Oregonian, you go even if it is raining. You get a great view of the city and the waterfront trail is lovely. I would start on the west side, where you can rent a bike, and make your way north across the Steel Bridge, then down the east side so you can see the west side. 2. Saturday Market. This is my favorite things about the city. They have local farmers selling their produce and stands of people selling their art and other crafts. There are also food carts and street performers. I always recommend the market to the place to experience Portland and have a fun Saturday morning. It’s the first thing I do whenever I come back to the city. 3. Go to brunch. Portland is a city that brunches. You can’t go wrong with brunch, so find a place based on your breakfast preferences. At Slappy's, pictured on the left, you can make your own pancakes. 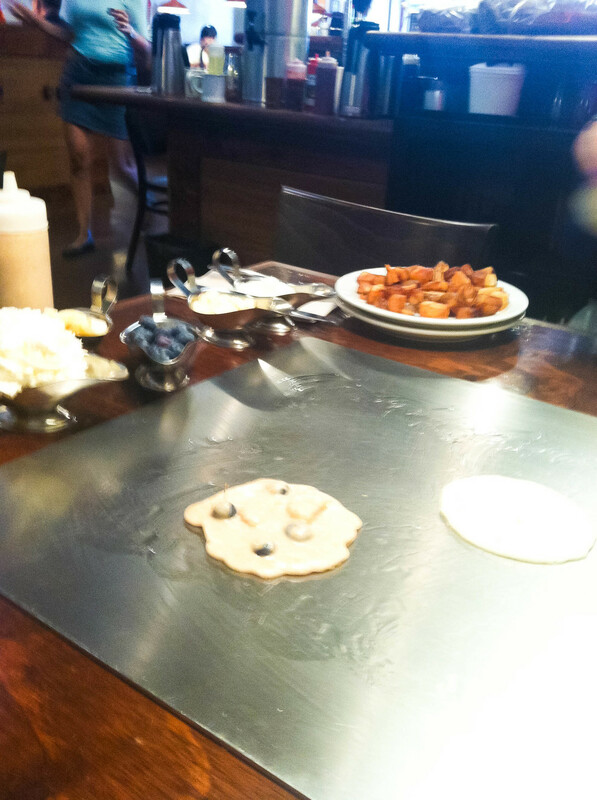 Each table has its own griddle.! 4. Browse Powell’s City of Books. This is block-long bookstore in SW that is a main attraction in the city. And it gets the attention it deserves, in my opinion. It is Disneyland for bookies, I tell ya. It is so big, they have maps and directories. So many books! Love it! 5. Lunch at the food carts. 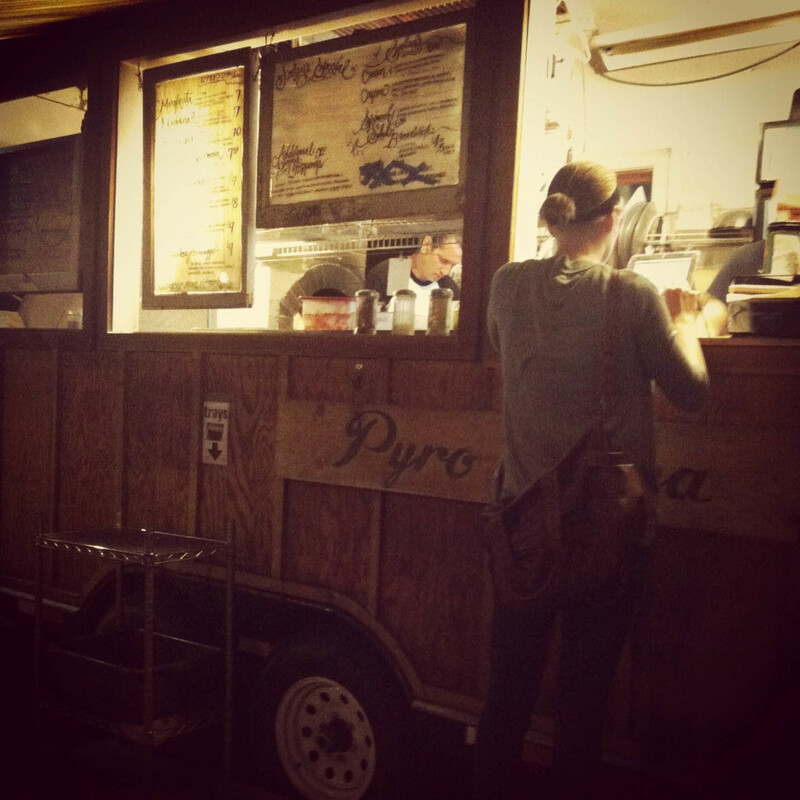 There are a few hubs of food carts downtown on both sides of the river. They have everything and the food is delicious. I like Pyro Pizza and PBJ’s Grilled on the east side. 6. 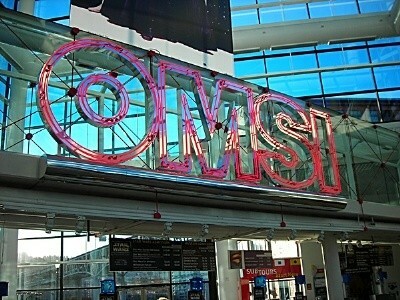 Explore OMSI. The Oregon Museum of Science and Industry is a fun museum with a permanent exhibit hall that’s all hands-on and pretty cool temporary exhibits. You could spend a solid amount of time here, so plan accordingly. Maybe this is for day two of the Perfect Day in Portland series. Either way, you can conduct your own experiments and see dinosaur bones and experience what it would be like to be in an earthquake. 7. Pioneer Square. There is always something going on in Pioneer Square on the weekends, like festivals and movies on big screens. It’s a central meeting spot in the city by the historical Pioneer Court. Some of my favorite street performers set-up around here. It is also by the Pioneer Place Mall, where there is good shopping. 8. Dinner/happy hour at Portland City Grill. The grill is on the 30th floor, so you get a commanding view of the city. If you go at a certain time you can get happy hour specials so it’s not too crazy expensive. Also, if you go at a certain time, you can get the sunset and the city lights at night. 9. See a show. My love of going to concerts stemmed from the music in the city and its venues. My favorite venue is the Crystal Ballroom in SW. There is a good mix of hip local bands that you’ve probably never heard of along with big names. 10. Voodoo Donuts. Probably the most popular food place in Portland, it is the collection of pure Portland spirit in one place. This place has it all: hip cashiers, post-modern art haphazardly tacked to the wall, puns, and owners that are authorized to officiate weddings. Oh, and there are donuts. Coco Puff donuts, donuts in the shape of Texas, voodoo dolls with raspberry filling. If you go at night, take a friend because you will run into…characters. It’s open late, so it’s a good place to go for post-show munchies. I hope you are now motivated to visit this lovely city! There are so many more things that I want to add to this list, but this should easily cover a solid weekend. Come on by; I’ll show you a good time. **most photos taken by michelle erickson, click others for source.